Samyang announced their first AF lenses for Sony E mount full frame mirrorless cameras: 14mm f/2.8 ED AS IF UMC and 50mm f/1.4 AS IF UMC (check pricing and availability). 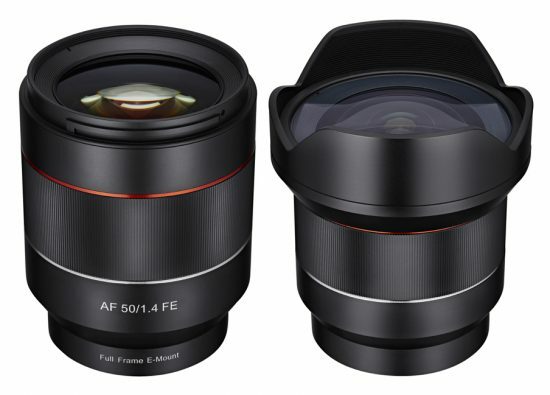 May 3rd, 2016, Seoul, Korea – The global optics brand, Samyang Optics today announced the long-awaited launch of two autofocus lenses: 14mm F2.8 and 50mm F1.4 lenses for Sony E mount Mirrorless cameras with full frame sensor size. The new 14mm and 50mm are the widest and brightest lenses in their classand offer superb quality images to photographers. This launching expands the boundaries of Samyang Optics photo lens line-up from manual focus only, to now include autofocus lenses. Both 14mm F2.8 ED AS IF UMC and 50mm F1.4 AS IF UMC are specifically designed to work in harmony with full frame mirrorless cameras in Sony E mount. The flow of light is devised based on the uniqueness of the distance from glass to sensor in mirrorless cameras to create optimal performance. Along with portability of mirrorless lenses, the 14mm F2.8 and 50mm F1.4 are compatible with full frame sensors to deliver the wideness and sharpnessof image to photographers. The 67mm filter diameter brings the maximum amount of light into the lens to create the best work of light in photography. The 14mm F2.8 is the widest angle available in the market and the F1.4 of 50mm and F2.8 of 14mm apertures are by far the brightest of full frame mirrorless lenses, offeringa beautiful bokeh effect and the best quality images under various exposure conditions. Based on Samyang Optics’ exceptional optical technology, aspherical lenses have been included in both lenses to minimise aberration and unnecessary light dispersion, delivering high resolution from the centre to the corners of the image. These new products will be the first autofocus lenses in over 40 years of Samyang’s class-leading core optics technologies.Samyang has captured the essence of world leading image technology with their manual focus lenses and reinterpreted it into autofocus lenses. Photographers now can enjoy the prime manual lens image quality and autofocus lens. These new 14mm F2.8 and 50mm F1.4 are compatible with both phase detect and contrast detect sensors to operate fast and accurate focus detection. The 67mm filter diameter is also the result of years of R&D for best handling, by adding stability to the photo-taking experience. Also the minimal and sleek design and metal-housing solidify the build quality with the internal focus system. These two new autofocus lenses from Samyang Optics will be exhibited at the Photo & Imaging 2016Show in Seoul, South Korea. The lenses will be globally available from July 2016. Further details, pricing and availability will follow. This entry was posted in Third party lenses and tagged Samyang. Bookmark the permalink. Trackbacks are closed, but you can post a comment.